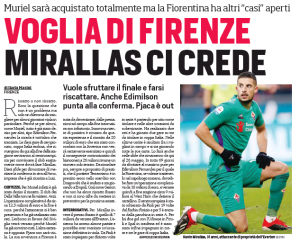 Despite himself talking about staying in Italy, Kevin Mirallas’ future remains a mystery, as Fiorentina still haven’t paid Everton the €7m to make his current loan a permanent move. With a four-year contract waiting for him if they do, the Belgian forward is keen to convince his current club to trigger the clause, and he’s only got 69 days left to do so. Corriere dello Sport explain that, so far, he certainly has made a convincing argument, at least more so than Marko Pjaca, but his output remains a bit of an issue. Scoring just two goals in 18 league appearances this season, of which only eight have been starts, Mirallas has played the part of the impact sub more than anything else. 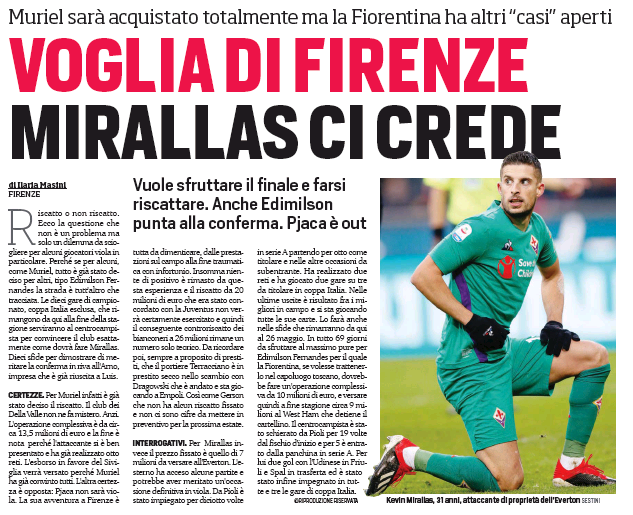 However, his last two outings, against Lazio and Cagliari, have seen him be one of the best players on the pitch, and there’s hope Stefano Pioli will give him a continuous run between now and the end of the season to allow the Belgian to ‘play all his cards’ and convince the Fiorentina board. All in all, he has until May 26th to earn Everton €7m and avoid an unwanted return to Goodison Park.